The subject that can prove to be immensely beneficial for a person when he is in need is astrology. When some problem arises in life and the person could not find any possible solution for it then they go for the astrological consultation. It is also searched for when someone needs to make a big decision in life. The events such as marriage, buying a property or investing money etc.call for the need for a phone consultation. This helps to get an idea about what the possible outcomes may be. Phone consultation is the best option to get advice from the astrologer by getting in touch with him on phone. This is especially beneficial in the present situations where people are very much busy in their daily schedule. If they are able to get phone consultation from astrologer then it saves much of their time and helps them in taking the important decisions of life. Astrologer Ashok Prajapati is the genuine and dedicated astrologer who always provides his followers with best of support and advice. He is always there when the followers are in need. 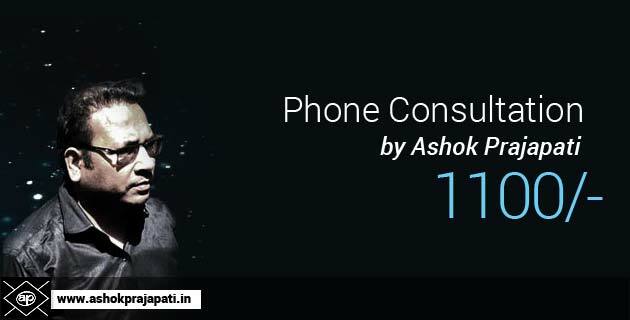 One can easily get the solutions for his problems from astrologer Ashok Prajapati through phone consultation. Just provide the required details properly to him and get practical solutions for the problems that you are facing. Easy process to get astrological consultation from well-known astrologer on phone in the hectic and busy schedule. No need to wait for long to get consultation on phone. It does not take much time to get the solution of problem from astrology professional. There is no hesitation in phone consultation and one can get solution for his queries freely. There are several misconceptions regarding astrological consultation and people think that it can be taken in face to face meeting with the astrologer. This is not true. Phone consultation is also an effective method through which one can get advice from the experienced astrologer and that too at the convenience of his place. It is just a matter of a call that can solve all your queries and provide solution for all your problems. Without waiting for days or long hours, one can easily get astrological advice on phone quickly. When someone face complex situations in life and has no idea to resolve them, astrology can help him. Just consult the astrologer, provide him the details such as birth date, time of birth, place of birth etc. and he will provide easy and practical solutions to solve the problems. Astrologer Ashok Prajapati is here to offer phone consultation and help people in difficult situations with his knowledge and experience in this field.